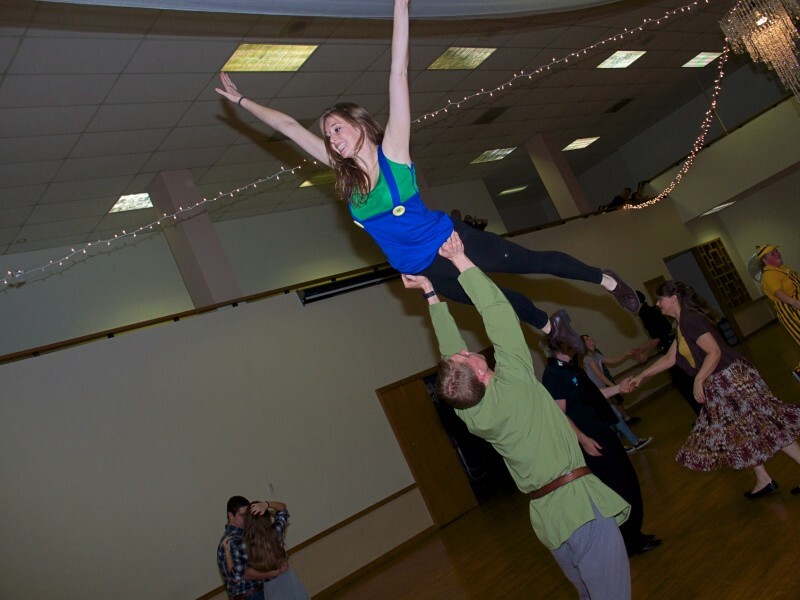 The Grand Rapids Original Swing Society draws record setting amounts of people together for swing dancing on weekday nights throughout the year—more than most major cities. Founder Steve Zaagman’s goal is to bring affordable dancing, fitness and fun to great venues in downtown Grand Rapids. Every Tuesday from 7 p.m. to 9:30 p.m., a lesson for beginners from 7 p.m. to 7:30 p.m. Check here for upcoming locations. Every Wednesday from 7 p.m. to 9:30 p.m. at Calvin College. No previous swing dance experience necessary! Grand Rapids is a dance floor that has held the title in the Guinness Book of World Records for holding the largest swing dance in the world. In recent years, the Grand Rapids Original Swing Society has brought East Coast swing to Rosa Parks Circle, the Public Museum, Downtown Market, Blue Bridge and more, filling up spaces with music and hundreds, even thousands of dance partners of all ages and levels of experience year round. For Zaagman, making swing dance happen in Grand Rapids began back in college at step one, joining a club that taught students, no matter their level of dance experience, how to swing. It was the 90’s, a revival of the swing dance era that first developed and thrived in the 1920’s, 30’s and 40’s. By graduation, he’d caught the bug and it stuck. Zaagman was asked to start a small swing dance group at a local college, which ended up drawing in more community members than students at the school, so they moved the group to a warehouse downtown. And when the group outgrew that space, they moved to Rosa Parks Circle to accommodate the rising number of people interested in dancing. Eventually, the costs for maintaining permits, insurance and security for the weekly events became more expensive than donations and Zaagman’s own money could support, so the Grand Rapids Original Swing Society became a non-profit organization, funded by grants that allowed large-scale downtown dances to continue. Matthew Gort, the vice chair of the Swing Society board, DJ’s the music at events, teaches lessons and fills in for Zaagman when he’s unable to lead. He first became involved when he went to one of the Swing Society events in 2010 and learned the basics. It’s been the social aspect that’s been most special to him since then. Those like Gort and Zaagman who have found a home on the city’s dance floor have seen how empowering it can be to spend time with other people in a way that’s active and artistically expressive. Ultimately, it’s not about technique but about having a good time. Movement and having a place to go.